There are places on the web to find information concerning most (but not all!) planes made by the Millers Falls Company beginning in 1929 and ending somewhere near 1984. To my knowledge, no one has compiled any information about those that carry other names anywhere on the web. I’ve been doing a bit of research and here is where I will post my results going forward, for better or for worse. I’ve been perusing a few local antique stores, much to my wife’s chagrin, and eBay on a quest for knowledge. eBay is normally a dubious source, but once you recognize the hallmarks of MF’s castings, you can usually tell right off what’s what. Millers Falls made planes for other outlets beginning (I believe) around 1935 or 1936. This notion is supported by the change from the now-coveted original feature set presented in the initial release. There were some improvements made to be sure, but the most striking difference was the removal of any reference to the make and model from the castings. In the initial release, the name “Millers Falls” was cast into the raised ring that marked the seat for the front knob, and somewhere behind the frog the model number was also cast. These features disappeared at this time. Also changed was the bedding for the front knob from a smooth seat to a ribbed one (presumably to prevent the knob from unscrewing during use – it works, but the wood of the knob is prone to split if screwed in too tight), the cutter depth adjustment yoke changed from a cast yoke to a stamped one, and the make/model was from that point on stamped onto the left cheek of the plane near the sole. For the premium line bearing the Millers Falls name there were a handful of other changes, but they have no bearing going forward with this article. Planes with the original set of markings are termed “Type 1” and those directly after this change “Type 2.” I believe that the reason for these changes was to enable the company to rebrand their products for the secondary market. There are a few items which are common to all of the rebranded bench planes. Millers Falls kept a few features for their own line, namely the jointed lever cap and the frog/mouth adjustment screw, but many of the planes in the table below reflect type changes from later in the premium product runs that help to date them. I will include this information to the best of my ability, but take my dating with a grain of salt. I have no black and white source for that information that does not originate with the accepted Millers Falls typing timeline established by Randy Roeder at www.oldtoolheaven.com. 5. none used cocobolo for the wooden parts. Millers Falls supplied the earlier-produced bench planes with a bit less in the fit & finish department. They spent more time on their own planes than they did these. For example, in the planes they made for Sears bearing the Fulton name, they did not mill the seat in the main casting for the frog, and they did not take the time to round over the transition made by the roundover cutter for the tote – they left it hard. In the lesser-priced lines with the Millers Falls name (for example the 900, 90, 814, etc.) the roundover blend was also ignored so it shouldn’t come as a surprise that they’d done the same with anything rebranded. Saving a buck to make a buck, one would suppose. There is an interesting aside concerning the cutter lateral adjuster lever for many of these planes. In the original Type 1 planes, the end of the lever is not the riveted washer that it is on later examples, but one stamped with a bulge in the end and then folded over to make the bearing surface for the slot in the iron to make contact with. In the “late Type 1 period,” this switched to a riveted washer like that of the Stanley planes of the same era. The secondary lines initially used the folded lever and continued to do so until the late 1950s it seems, while the premium line switched to the riveted slightly before the rest of the Type 2 changes appeared. This in itself isn’t worthy of much note, but what is is that the secondary lines for Sears used both for at least two decades! Millers Falls also used steel depth adjustment knobs for the bulk of the rebranded lines. But I have personally seen examples that carried the premium brass knob. The same goes for the brass nut / steel post combo for attaching the knob and tote. The early Fulton brand used a steel knob but brass nuts exclusively (note: this is reflected in my personal collection and in every example I have seen to date; if there are others out there that do not conform to this standard I would be glad to hear of them), but others used different combinations at different times. If there is rhyme or reason to it, I am sure that I simply have not seen enough hard data to sort it out. I am sure there is a pattern at work but that I just can’t see it yet. More data is needed. As far as I can tell the block plane typing follows the parent Millers Falls typing to a tee. Generally, after the Type 1 -> Type 2 changeover, precious little changed in terms of details until the individual products were discontinued. 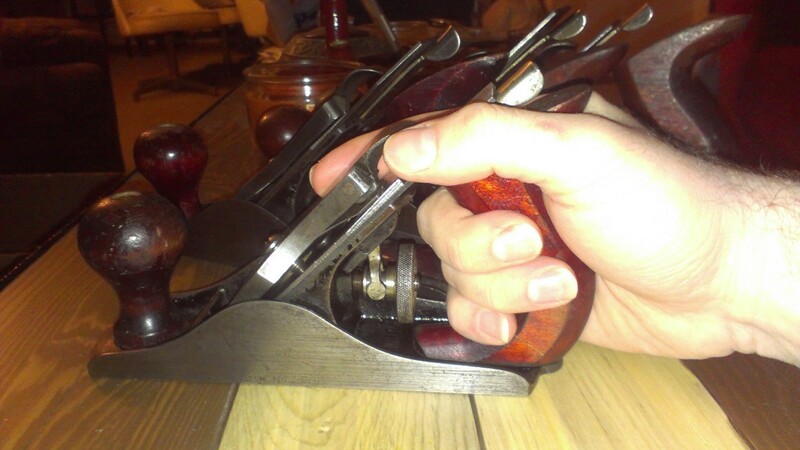 To wit, the only way I know how to date a Millers Falls block plane after Type 2 is by the stamp on the iron. This is a dubious method at best (especially considering that irons can be used up and replaced! ), but it seems to be all we have for the bulk of the lines. There was a change made to the 07 skew rabbet block plane’s cutter depth adjustment mechanism, but this does not figure here due to the fact that Millers Falls appears never to have made this plane for anyone else. As far as dating the rebranded lines, we have to use logo or stamp recognition rather than a list of known feature changes. There is a single exception to this concerning the Craftsman 107-37032B and the Millers Falls 16C noted in the table below. Please note that this table is ever-expanding and that if I have made a mistake concerning typing or in my comparison to another model, I’m either aware of it and have not yet fixed it here or I’m not aware of it at all. Please, if you have any more information, look me up on the timetestedtools.net forum or alternatively use the Contact page for this website, and tell Don that you have something for me. He’ll get me in touch with you; I’m not going to spray my email address all over a public website. Please note an important item #1: some of the model numbers for the Sears planes were also used by Sargent, and at least one (the Craftsman 3705) was used twice for two completely different planes – a 6″ knuckle block plane and a tiny model-makers mini plane. If telling the difference between a Sargent-made plane and a Millers Falls one, please use common sense. Please note an important item #2: when I am giving the equivalent model numbers for these planes, I am aiming for consistency. In the Fulton line more than any other, there is a model overlap where the model I give is not as “feature-identical” as another produced at the same time. The reason behind this is that during that period, there are two rebranded planes that did not have feature-identical models bearing the Millers Falls name at all, the 3708 and 3709, while the 3710 and 3711 are feature-identical with the Mohawk-Shelburne versions of the 900 and 814, respectively. I left the table showing the premium line and not the secondary line as Millers Falls never made a secondary line with equivalents for the two smaller planes. The original version of this article spread across posts on two online forum websites contain a very extensive list of changes and updates as I learned new things and found new planes. I have ripped that out and eaten it as it became all mooshy and stringy like spaghetti and yum. Fulton 5272 #8? #3? Looks identical to a 3709. I do not have measurements so am judging based on proportions. Fulton 5262 #14 #5 Looks identical to a 3711. Craftsman 3CBB #8 #3 MF Type 2, late 1950’s, blue Craftsman logo on lever cap. Both lateral lever types on observed bench planes. Craftsman 5CBB #14 #5 MF Type 2, late 1950’s, blue Craftsman logo on lever cap. Both lateral lever types on observed bench planes. Craftsman 6CBB #18C #6 MF Type 2, late 1950’s, blue Craftsman logo on lever cap. Both lateral lever types on observed bench planes. Craftsman 7CBB #22C #7 MF Type 2, late 1950’s, blue Craftsman logo on lever cap. Both lateral lever types on observed bench planes. Dunlap 3DBB #8 #3 MF Type 2, likely after WWII for all Dunlap planes. I do not know the timing of the Dunlap lines. Washer lateral for all observed bench planes. Craftsman 107-37032B #16C None As mentioned in the text above, this plane has depth adjustment mechanism that is slightly different from the standard #16 / 37032. There is a round post on the frog that engages oblong holes in the cutter rather than a tooth that engages a series of horizontal grooves as it is in the other plane. This has also been observed in very late MF 07 skew rabbet block planes and the rarely seen MF 17B. Craftsman 107-37039 #85 #78 Duplex Rabbet / Filister. Note: I have only seen one example of this plane with the make and model stamped into the cartouche on the right side where Millers Falls marked the premium version. It is possible that all that are unmarked are the 3730 above and only those stamped with 107-37039 are this model, but I am aware of no way to tell the difference. There is a Fulton 3709 that does not have its name stamp on the left cheek, and others of that model have been spotted both with and without this feature. I believe the missing stamp is in error as all of the other Fulton planes manufactured by Millers Falls have the stamp. Possibly a batch was shipped prematurely, or QC just didn’t check a pallet of them? 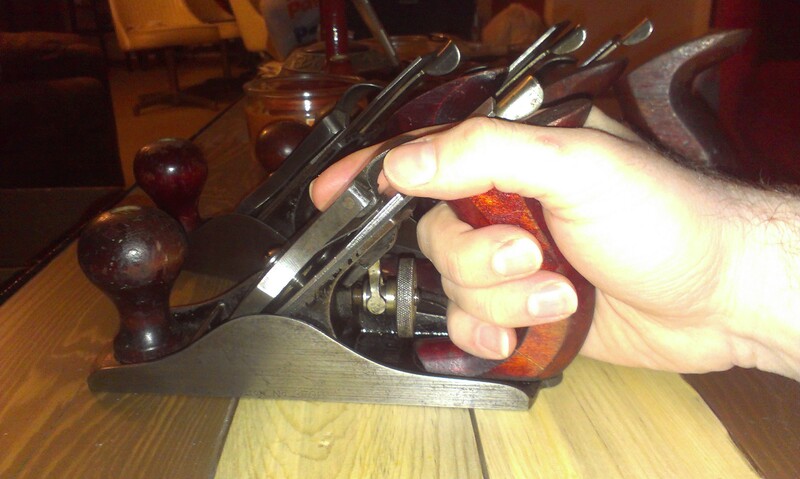 In any case, it seems the only bench planes that lack the brand name on the cheek are the Sears branded planes (the brand is cast into the lever cap), the Dunlap planes, and the early Craftsman bench planes – namely the 3CBB through 7CBB. These planes have only the model number. All Fulton bench and block planes (save the one excepted noted already), early Craftsman block planes, and later Craftsman bench planes are stamped. The Craftsman name is stamped in a different font from the Millers Falls and Fulton name stamps, and the later numeric characters are also different from the older original stamps. I now have pictures of planes depicting all of these logos. A note on the numbering system and on the two-letter Sears OEM codes: “BB” is on the Millers Falls items and seems to be from before the numeric OEM codes, “BL” was used by Sargent, “DD” was used for Stanley (http://vintagemachinery.org/craftsman/manufacturers.aspx?sort=2). “107” is Millers Falls’ later code; “619” was for Sargent but the number seems to have been recycled for “Arps Corporation,” whoever that is, and “187” was (still is?) used by Stanley, for the record. Worthington Unknown #900 #H1204 Appears to be a MF Type 4. There is no stamp on the side of this plane, the only name brand on it is the Worthington sticker on the lever cap. Just a guy who collects stuff because he's pathological.